Gleaner Heights is a retro-style farming simulator that mixes gameplay from games like Harvest Moon with themes from macabre storytellers such as H.P. Lovecraft. This game about a small town with a dark side will be released later this month. Similar to the popular and critically-acclaimed Stardew Valley, Gleaner Heights is a farming simulator developed solely by one man. 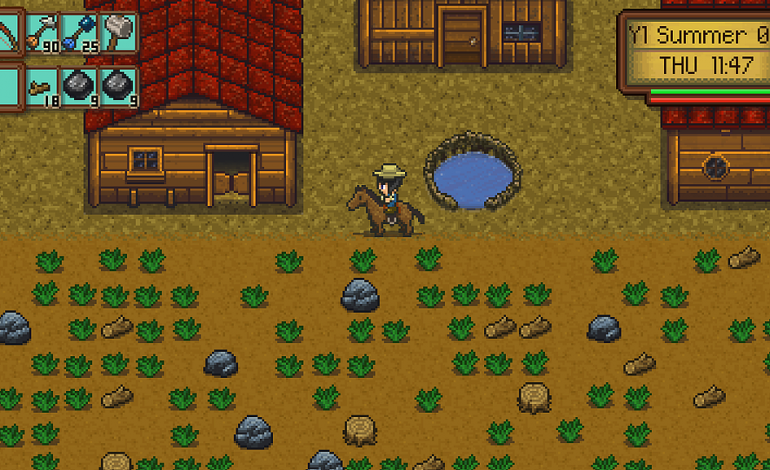 During the game’s daytime, players perform duties similar to other games in the genre, such as growing crops, managing the animals, and tending to the townsfolk. However, the game takes a sinister turn as soon as the sun begins to set. The town the players inhabit, called Gleaner Heights, possesses a haunting past riddled with terrible events that occurred prior to the player’s arrival. The supernatural horrors that lurk the town must be confronted, and the player is set to be the one to break the cycle of destruction or inherit its madness. The game’s creator, Emilios Mandolidis, states that this game is an experiment on how people will react when their seemingly benign farming town is inflicted with real world consequences. The game is entirely stripped of the innocent of a usual farming simulator, and instead, revels in the tragedy of actual farm life. In a usual farming simulator, if a farm animal is neglected and dies, its corpse will immediately disappear. In Gleaner Heights, its body remains to decay as it would in any real situation. Confronting reality is a paramount aspect of gameplay, and one that players need to incorporate into the daily tasks the game employs. Gleaner Heights still grants players full autonomy if they wish to play it solely as a farming simulator, but it will not necessarily progress the story. If players choose to plant seeds and tend to animals, completely avoiding the underlying horrors, they may do so by all means. Players also have choices when it comes with how they interact with the horrors they confront. Helping or hindering are possible interactions in all situations, but players must understand that their involvement is cemented from the start. If the player chooses to become involve with an NPC, they do not have the option to merely walk away from their story when it’s over. The ghosts of victims will haunt the player for the rest of the game should they choose to misguide them. Gleaner Heights will be available on Steam on February 21. Manolidis plans to continue updating the game after release, which can be followed through the game’s Twitter.